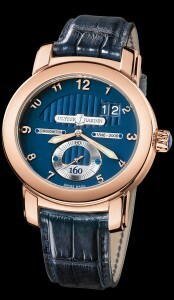 Presented for Ulysse Nardins 160th Year Anniversary. This is the STUNNING Caliber 160 limited edition to 500 pieces in high polished,18K red gold case, automatic movement,with a royal blue dial, big date. The 22K white gold rotor is engraved with the Ulysse Nardin 160th year logo and is visible through the exhibition case back,navy blue leather strap with 18K red gold folding buckle.